A true statement of Love unfortunately people can so easily act the opposite. I’ll never forget once when my parents were arguing my Mom saying, “I do not like your Dad”. As a child this comment was kind of scary and I quickly said to settle my worries,”that’s not true Mom you love Dad.” She replied,” Oh I will always LOVE your dad but right now I don’t like him”. What a true statement in a marriage. Marriage is not perfect and marriage is not easy. There WILL be times you do not like the way each other is acting. The sooner you realize that marriage is not that fairy tale love story you thought of as a child the happier you will be in your marriage. Many people think living together helps you know if you are ready to get married. I disagree if a whether or not a person puts the toilet lid down would change how much you love someone then you probably don’t love them. If living habits dictated love all parents would struggle to love their children! Living habits are habits and they can change or sometimes you just get used to checking before you sit down. For better or for worse right? God knew there would be worse, he knows human nature. What you should love a person for are their values, their strengths and weaknesses, their compassions, their dedication, their love. We all know that after you are married some of those “romantic” things go away. My husband sometimes jokes, “I used to do that when I was courting you.” If you sit down and think about what the media considers romance and what real romance is you realize they are not the same. Before you were grandparents, parents, a husband or wife, you were dating. You might have received flowers on your 1 week anniversary and dates every Friday night. Those are things you probably got from other boyfriends or girlfriends too. Outside of that though you saw something special in your spouse that made your heart smile and you knew you were meant to be together forever. Even now when you know their worst habits and you are so busy with life you may rarely have time alone together that your eyelids are not fighting to close to sleep, you are both still that person who once gave each other butterflies when going out together. So take a minute and look at them through the eyes you discovered them and then add to that the thousands of things that have added to your love for them throughout your marriage. Think of the romance that is still present. It may be as simple as buying you your favorite candy bar. Combine all those things and you will likely fall head over heels for them again. Having the perfect marriage is not about never fighting, amazing romance, and always being at your best. It’s about fighting and forgiving, appreciating the small moments together in a busy life and loving each other even when your crabby wearing baggy sweats with bad breath and messy hair. In honor of Valentine’s Day (a few days late) do some of the things you used to do before adult life happened. There is no need to be elaborate. Sit beside each other and watch TV, fight the urge to dose off and stay up late together to play a game or watch a movie or just talk. Hold hands, dance in the kitchen and sleep right beside each other and smile as you dose to the music of their snores. Pray together. 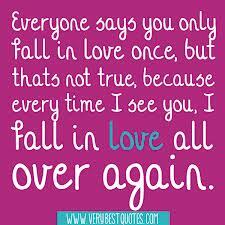 You will Fall in Love all over again and see the perfection you have in your marriage. Thanks for commenting on Scratch Paper Essays. Run like your Melody Fairchild, run like your Suzy Favor-Hamilton, Oh JUST RUN!!! Lent, Just 16 days left, or just the Beginning? Advent: The First Week, Deck the Halls!